The Madrigals performing during their annual Variety Show. GALLIPOLIS — Soon, members of the Gallia Academy Madrigals will be able to say something most musicians will never be able to say: “I’ve performed at Carnegie Hall.” Undeniably one of the most prestigious music venues in the country, artists ranging from Tchaikovsky to The Beatles have performed on its stages since it opened in 1891. Director Nattalie Phillips said performing at Carnegie Hall is definitely a goal for most professional musicians. “There are a lot of places around the world you might want to play [as a professional musician] and Carnegie would have to be one of those places,” said Phillips. The students earned the opportunity to perform at Carnegie Hall after competing in the Boston Heritage Festival last year when they and the Gallia Academy Symphonic Band traveled to Boston, Mass. with the World Strides organization. The Madrigals earned a Gold 1st Place rating in their category and with it, the opportunity to perform with winning groups from other festivals at the prestigious venue. Not only will the students get to perform with approximately 400 other students from all over the nation, they will also be under the direction of renowned composer and conductor Andre Thomas, who is the Owen F. Sellers Professor of Music, Director of Choral Activities and Professor of Choral Music Education at Florida State University. Phillips has been director of the Madrigals since 2013, a group that has a long history of excellence at Gallia Academy High School. She works hard to uphold the traditions and excellence forged by those who came before her. “We really preach hard to the kids about what it means to be a Madrigal. 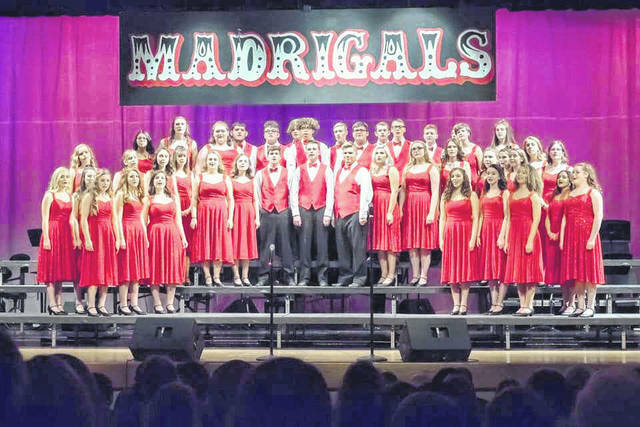 And most people in the community know what a Madrigal is and what it means, especially if they graduated from Gallia Academy,” said Phillips. The one change she’s made is the addition of more members, which Phillips said fares better at competitions and festivals. While it was historically complicated to attract enough male voices to the group to allow for a larger presence, in recent years they’ve had more interest, which in turn allowed the Madrigals to grow in size to over 40 members. Commitment to excellence and to the community that supports them has not changed. As with any student organization, the Madrigals rely heavily on the community for donations and support and Phillips said they never disappoint. While donations are appreciated, Phillips said she is always looking for the opportunity for the students to earn those donations by performing for organizations or at events. In addition, the Madrigals regularly performs at events and places like schools and assisted living facilities to give back to the community. The Madrigals will perform at Carnegie Hall on March 24, 2019 and tickets are on sale to the public, ranging in price from $40 to $85. The trip was made possible in part through the support of various individuals and businesses in the community, including but not limited to Holzer Health System, Osmosis Marketing Solutions, Ratliff Pool Center, Gavin Power Plant, Sliver Bridge Coffee, Bob’s Market and Greenhouses and Angel Accounting. To keep up-to-date with The Madrigals, follow them on Facebook at @galliaacademyvocalmusic.